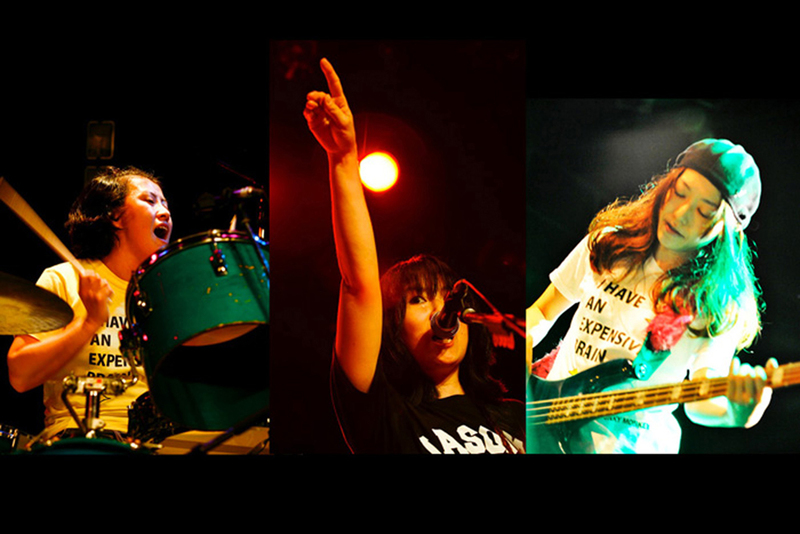 Super Junky Monkey are a gutsy, innovative band of four Japanese women that began playing in 1991. Singer Mutsumi “623” Takahashi, guitarist Keiko, bassist Shinobu Kawai, and drummer Matsudaaahhh!!! released the first Super Junky Monkey album, the all live indie release “Cabbage,” in 1993. The album showed their unique and furious, yet fun, brand of jazz, funk and hip-hop-spiced grunge rock, which some compared to the Red Hot Chili Peppers and Rage Against The Machine. The band had serious chops as musicians, often playing intricate and sometimes odd musical parts, and had a dynamic front person in Mutsumi. The band and the album gained critical acclaim, which resulted in their second album, 1994’s “Screw Up,” being released by Sony, which did not in any way tame the band’s adventurous character or provocative lyrics, which were often in English. In 1993, Super Junky Monkey played CMJ’s Music Marathon in New York and went over quite well. In 1994, the then leading English language magazine in Japan, Tokyo Journal, named them “Band of the Year”. In 1995, the band released the EP “AIETOH” and played the Foundation Forum, a “hard music” convention held in LA, where they were perhaps the most talked about band of the event. They also had their first American release in 1995. The band continued with Sony for two more albums, “Parasitic People” and “Super Junky Alien,” which were progressively weirder and wilder. They continued to split their time between the US and Japan, and in 1996 again played in New York. In 1997 the band was basically inactive. However, things started to pick up again in 1998. They played dates in Japan with American all-woman punk band L7 and began recording demos. On Dec. 24, 1998, the band was to play their last show with the original line-up. To the shock and sadness of many, especially within the indie music community, Mutsumi died on Feb. 5, 1999; this was to be the end of the original lineup of Super Junky Monkey. A tribute to Mutsumi was held on May 9, 1999, and subsequently a retrospective album called “Songs Are Our Universe” was released on 3rd Stone Records. On June 20th, 2009, 10 years after the death of Mutsumi, Keiko, Shinobu and Matsudaaahhh!!! played together on stage at the Liquid Room in Ebisu, Tokyo. They played together again on Red Marquee Stage at FUJI ROCK FEST.2010.